Be a denim pioneer by wearing chinos. Confused? Read On! If we are to be pedants about it and take this literally… we’d look around expecting to see someone carrying two rolls of denim. 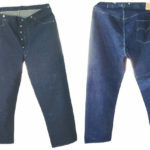 Or maybe wearing those Studio D’artisan jeans that are made from two different denim fabrics. You see, when it comes to denim and when it comes to jeans, they are so interwoven (pun totally intended) that we tend to forget that denim is the fabric and jeans are the garment. Denim is made into jackets after all. Jackets, kimonos, bags, belts, dungarees, overalls… hell, Nudie did a denim kilt a few years back. Whatever you can think of clothing wise, someone will have inevitably made it in denim at some point. And this is just what Oni Denim have done with their take on the Chino. And we have to say, they have nailed it! Chinos, they’re like Khakis, right? Chino’s are normally found in lighter cotton twill fabrics, most commonly in beige but of course can be any colour. The can get a bad wrap because of the suburban dad association but actually, this is because many people mix them up with Khakis. They are similar, but actually two distinct garments. Both Chino’s and Khakis originated from the military but Chino’s are a more recent development and are therefore more tailored and more formal. They are more fitted thank khakis with concealed back pockets and hidden stitching and usually in a lighter weight fabric than Khakis. Oni doing what they do best! For Oni’s Chinos, they have gone for an 11.9oz denim with a greyish tinge and a rough textured look that belies the soft supple feel of the denim. Oni is very well known for their slubby denim and this lightweight fabric has all the true characteristics of an Oni denim. The fit is relaxed but tapered keeping to that formal air and the detailing such as the coin pocket, concealed rear pockets and lining on the waistband and fly is executed with that Japanese skill and precision we all know and love. If you are looking for something for the summer that ain’t jeans but you can’t quite bring yourself to step totally away from indigo, this could be a great way to go. This is the first run of this denim and this style and the numbers are super limited. Head over to DC4 in Berlin to pick a pair up.